Salvation refers to deliverance from an undesirable state or condition. A few weeks ago I was headed home at night along Interstate 66, which links northern Virginia to Washington, DC. The drive home was about 25 minutes, so I began flipping through radio stations to kill time. I came across a religious broadcasting station—one of those stations that the United States seems to have in clear abundance compared to Canada—just as a call-in talk show was getting underway. The host of the show—a fogey who sounded so ancient, he must have helped Noah haul lumber—was asked what he thought of Billy Graham-esque revivals that promise “salvation” at the mere click of a prayer button. “The problem with Graham and other mainstream evangelists,” wheezed the host, “is that they promote a sort of do-it-yourself salvation. Ask for salvation, they say, and you’ll get it. Well, they’re wrong. Only Jesus decides who gets saved. What we want has nothing to do with it.” So much for good behaviour. I quickly flipped to another channel, and thought of how hung up people must have become on “salvation” for one evangelist to label another one “mainstream.” I mean, the sheer slander of it. Though I live in uber-liberal Washington (which lies a safe distance from the Bible Belt), even here salvation is only a three-minute walk from my front door—the nearby major street intersection is home to three large churches. I’m sure I could go one Sunday morning and get an idea of what certain groups of people think salvation is. But I’d probably end up spending most of the sermon wondering just how many people in the church think their presence in the building is saving them. The last time I was in this setting was the last day I regularly attended church, almost fifteen years ago in parochial Drummond, New Brunswick. Maybe he was secretly telling us he was lonely. 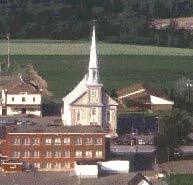 Saint-Michel parish was a one-priest town, and with no newcomers on the horizon, the presbytery must have been some quiet. But his words struck like a whack to the back of the head, and I sat bolt upright in my pew from the revelation—Horse patties, Father; it’s because you tell half of us we’re not fit to stand at the pulpit. Goodbye. I stayed the rest of the Mass out of politeness; soon thereafter I touted “homework” as my reason for staying home on Sunday mornings. The Word, as it was framed in the language of Men, had lost a lot of its relevance to me in that one pivotal speech. I didn’t give much thought to salvation after that. My studies at Mount Allison University did little to revive my churchgoing. I found myself drifting even further from the hope I’d once held in learning something more luminous in junior high catechism class than the fact that Led Zeppelin songs, played backwards, apparently came straight from Hell. I graduated perfectly happy to dabble in the occasional alcohol-induced discussion on The Meaning of Life, and headed right for what I believed was the exact opposite point, both geographically and religiously, from Grand Falls, New Brunswick—South Korea. In the weeks leading to my departure, I diligently dog-eared pages in my Lonely Planet Guide which described the biggest, oldest and most beautiful Buddhist temples in Korea. I didn’t see any temples during my first week in Korea. Ironically, I did see a lot of churches. Hundreds, it seemed. 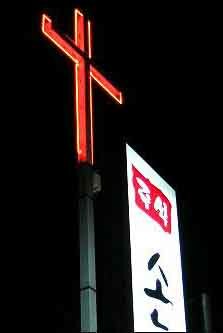 Late at night, when I looked out from my tenth-story apartment window over the darkened city of Inch’on, it was garish neon crosses, including the one right down my street, that announced Christianity’s solid establishment in Korea. 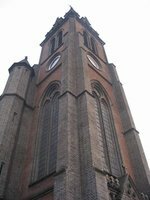 Soon I noticed my adult students were quite fond of talking about their churches, in the manner one talks about a really trendy stock option. This only reinforced my smug belief that church was little more than a blinking neon sideshow. I mentally scheduled a visit to a large temple in Seoul for the last Sunday of my first month in Korea. Forget salvation; I was ready to give enlightenment a try. To this day, I still think I found both that one night in Korea. It was a week after I’d arrived in Inch’on, and I’d taken the subway to an Internet café. I thought I had the route, including all the bus stops to the subway station, perfectly memorized. It was only on the return trip late that night, when I surfaced above ground from the subway station, that I realized I’d taken a wrong turn in the vast underground mall that was part of the station. My bus stop was nowhere to be seen on the darkened street. I started walking, hoping I’d soon spot it. When no such stop materialized, I took stock of my surroundings: buildings, taxis, and signs written in Korean, which I could not read, speak, nor write. In fact, I couldn’t even hail a cab. I hadn’t yet bothered to memorize, or at least learned to scribble, my address and phone number in Korean. With no recognizable landmarks to guide me, and with English barely understood in these parts, a sinking sensation weighed on my shoulders. I was utterly and completely lost in a huge, dark foreign city. I kept walking. My heart rate escalated and my breath shallowed with each block. I screened the street, the buildings, even the graffiti for any sign that I was near my neighbourhood. Nothing. I must have walked for over two hours, because even late night convenience stores were locking up when I wandered into yet another block of featureless, look-alike high-rise apartment buildings. Almost frantic, I was out of solutions other than finding a cardboard box and an alley to sleep in. And if that happened, what of the following morning? The same buildings and neon signs would still be there, helping everyone but me. In a moment when all my worldly resourcefulness couldn’t have helped me, I had let go and asked, because in that crazy moment, I believed it could help. The answer I’d gotten was absolutely nothing like the contrived faith I’d given up on in catechism class. It was sudden, weightless and exhilarating, like wind hushing through boughs of pine. This, I thought, is what rescue feels like. Salvation. The thought of the incident still gives me a slight frisson. I can’t help but wonder if Billy Graham has ever felt it, but something tells me he’s never gotten himself into a situation quite desperate enough to come close to it. I’m not sure I even deserved it, considering there are plenty of people far more desperate asking for salvation every day, and still waiting for it. Whatever it is, I can smile at crosses now.